Seeking Someone to Love — Yes, Pit Bulls Are People Too! I am a pit bull lover. Yep, it’s true I believe pit bulls are the best dog in the world if you’re someone who wants a sweet, affectionate, social butterfly who would do anything you want for your love and attention then a pit bull may be the right dog for you and your family. They will easily become your best friend because, like many people, all they are seeking in life is true love and a little bit of kindness. Anyways, the reason I am writing this post is to advocate for these dogs that are vastly misrepresented in the media and as a result they line the cages of dog shelters countrywide. And in some cities they’re not waiting in sadness for the love of a human family because instead they are being slaughtered by humans as a result of media fear tactics. Please consider adopting a pit bull. There is no dog that will be more loyal to you and your family. 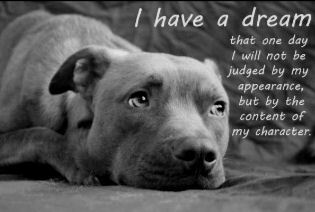 But please, before you to consider adopting a pit bull check and make sure your city has not outlawed them as some have done. Some cities are so fearful they will come to your home and remove a puppy and have it euthanized before the end of the day. And it’s not just new dogs either. You could have a ten year old pit bull that never caused any fear of harm, but in some cities in America, if they learn you have it, they will come, take him, and “euthanize” him before you have time to file paperwork with your local court system. Educate yourself about the breed and the laws where you live. Evaluate your circumstances. Can you commit to providing this animal a safe, healthy and happy home for the next 20 years? Every dog should attend obedience training classes and every member of your family should attend the class as well. In a house with two adults and three children it can be pretty confusing to a dog as to what we expect when each human uses different words or body language. Consistency, as with children, is key. Remember, obedience training isn’t just about teaching the dog to behave. It is a shared experience that will develop and strengthen the bond between the dog and his family. This is supposed to be fun! Once your dog is socialized properly you will never have to fear what your dog may do whether he is with other dogs or the children, whether you are with him or have a friend doggy-sit while you’re on vacation, you can feel confident he knows what is “playing” and what is not. *Masticatory Muscle Myositis (MMM) or Extraocular Myositis (EOM). For more information about these canine diseases please visit: THIS PAGE.